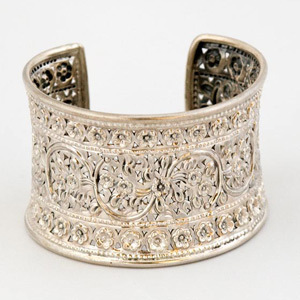 The jewelry artisans of northern Thailand craft this gorgeous sterling silver bracelet by hand. The exterior is decorated with an intricate floral and vegetal pattern. 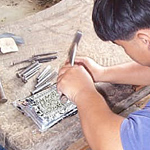 This handmade item may vary slightly in weight and size. Color discrepancies may occur between this item and your computer screen. (*) The interior circumference is slightly adjustable. 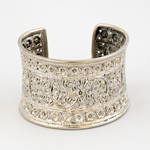 This bracelet is handmade by silver jewelry artisans in a small workshop located in Nan, Thailand.